The Metropolitan Railway in London opened the first underground railway in the world on 10 January 1863 with a line that ran between Paddington and Farringdon Street. This new and exciting mode of transport, considerably faster than taking a horse and carriage or walking, was immediately popular. The first train carriages had wooden frames, were lit by gas lamps and had leather seats. Despite assurances that the specially designed locomotives incorporated condensers to minimise steam and smoke, and the provision of ventilation shafts at regular intervals along the tunnel, the air in the carriages was often far from fresh. 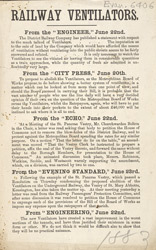 This leaflet presents the arguments against the proposal by the Metropolitan Board of Works to 'abolish the Ventilators', as reported in the press from 20 to 23 June 1883.